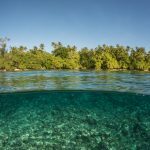 The last months have been quite busy – after coming back from French Polynesia, I was working throughout December and January and then embarked on a five-week Pacific Expedition at the beginning of February. 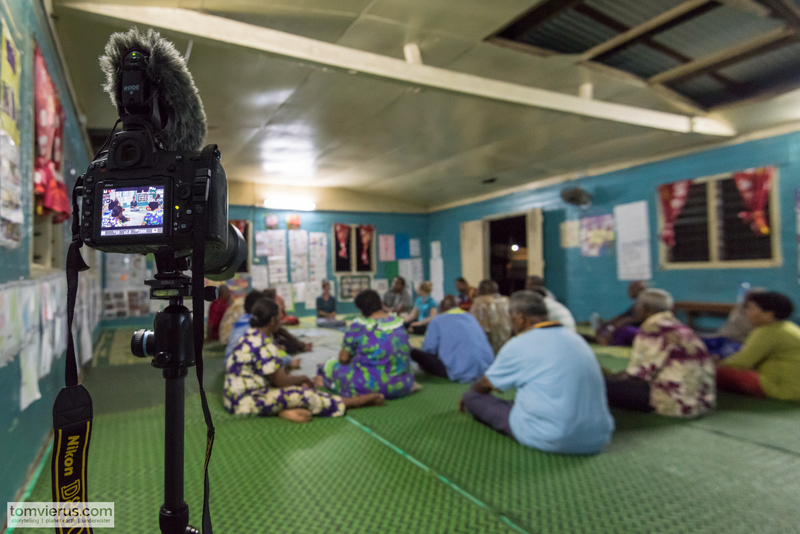 I joined the REPICORE team led by Dr. Sebastian Ferse on a feedback trip to Fiji and the Solomon Islands to a) photograph their trip and b) create a shortfilm on their main findings over the five-year-long project. 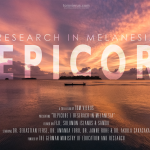 The expedition team consisted of the three PhDs of the REPICORE project, which is funded by the German Ministry of Education, and the principal investigator Sebastian. 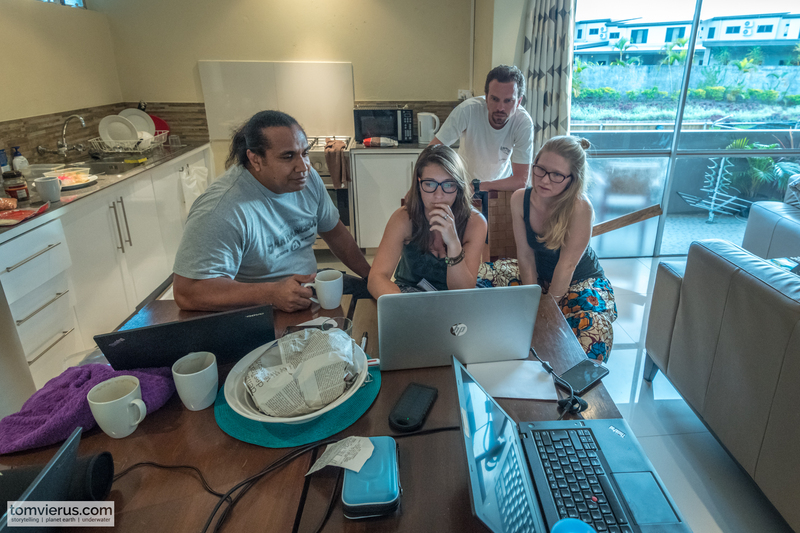 While Dr. Amanda Ford, the ecologist of the team specializes in coral reef ecology, the two Ph.D. candidates Janne Rohe and Akuila Cakacaka concentrated on the social part. All three have spent extended periods in the field (Papua New Guinea, Fiji & Solomon Islands) to undertake their studies. As the REPICORE project is coming to an end, the team felt the importance of a feedback trip back to the respective countries and communities. The aim was to communicate their findings to various stakeholders such as the relevant policy makers, NGO representatives, villagers, and chiefs. Bringing back the results to where they belong. Welcome home.. Fiji I missed you! 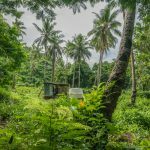 Before the trip started Amanda and I enjoyed a few days of holiday on the beautiful island of Viti Levu in Fiji, where we had time to dive back into our time here almost two years ago. We met up with old friends, made some new ones and had time to prepare for the upcoming trip. 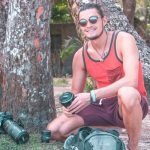 My Tamrac Expedition 8 bag was packed with the usual suspects such as the Nikon D810 and an array of lenses such as the Nikkor 16-35mm f/4, the Nikkor 50mm f/1.8, the Nikkor 85mm f/1.8 and the Nikkor 105mm f/2.8. 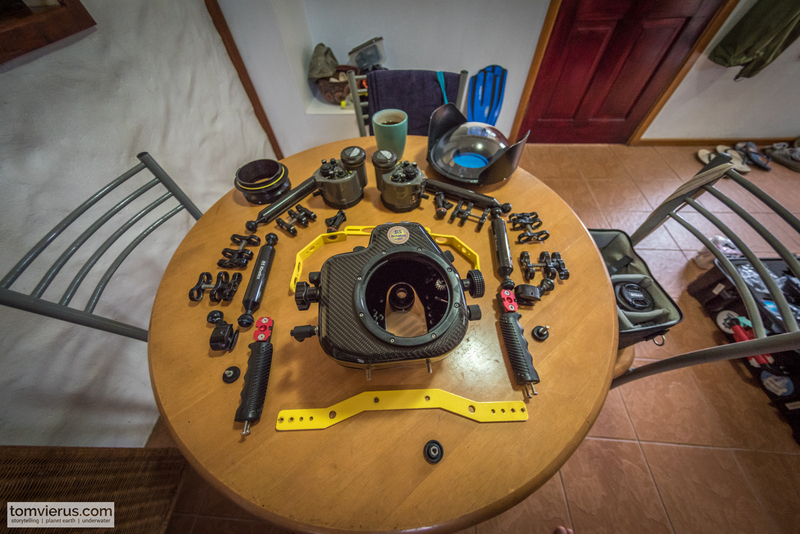 Besides the backpack, I had my Pelican case with all my BS Kinetics underwater gear as well as a small Deuter backpack with my f-stop inlay and the DJI Mavic Pro. 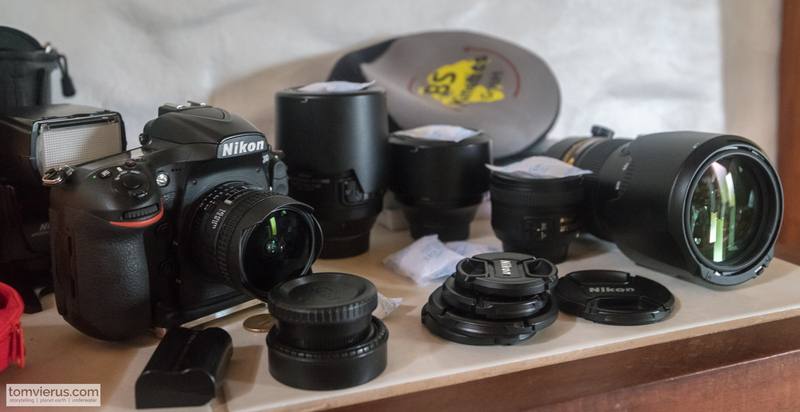 Just prior our flight, I was extremely happy to receive the support of Nikon Germany, who sent me the Nikon D850, the Nikkor 70-200mm f/2.8, and the Nikkor 16mm f/2.8 fisheye as support for the trip! The Nikon D850 is an incredible camera. One of my favorite features is the touch screen focus – absolutely brilliant for video! 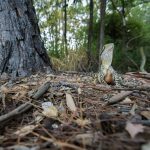 I was super excited to test and use the gear over the coming weeks and provide some exciting feedback on the performance of the Nikon D850 compared to the Nikon D810. 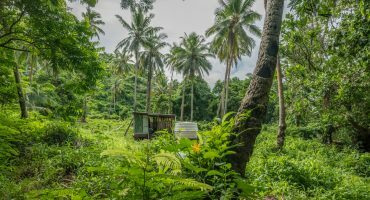 Especially in the harsh and challenging conditions such as the ones lying ahead of me: a lot of rain, high humidity, boat rides, salt water, and the merciless hot sun we were about to encounter in the Solomon Islands a few weeks later! 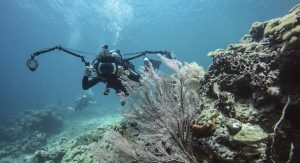 I was thus traveling very heavy (more than 60 kg) but at the same time able to record in all dimensions – air, underwater, and topside. 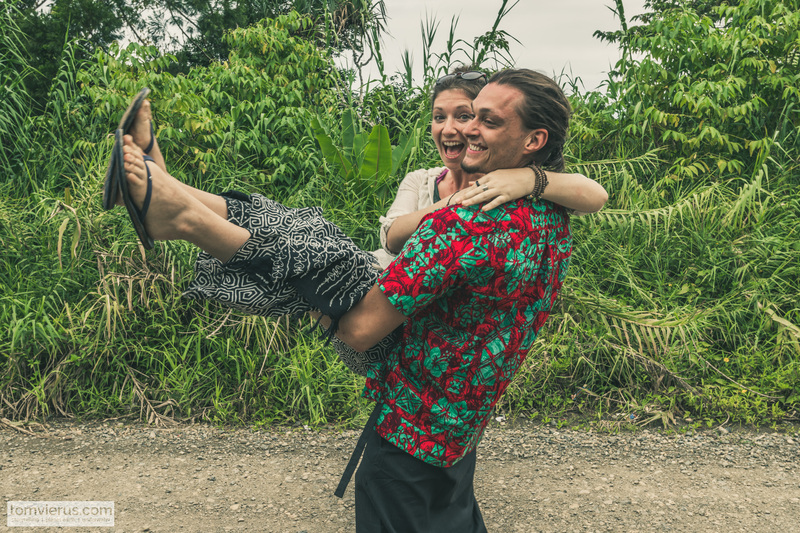 Over the first few days, I recorded some fun footage with Amanda and created a little short movie – A breath in Fiji – check it out below! Since we were planning to shoot a non-commercial shortfilm about the team’s work, I had to obtain all necessary filming permits. 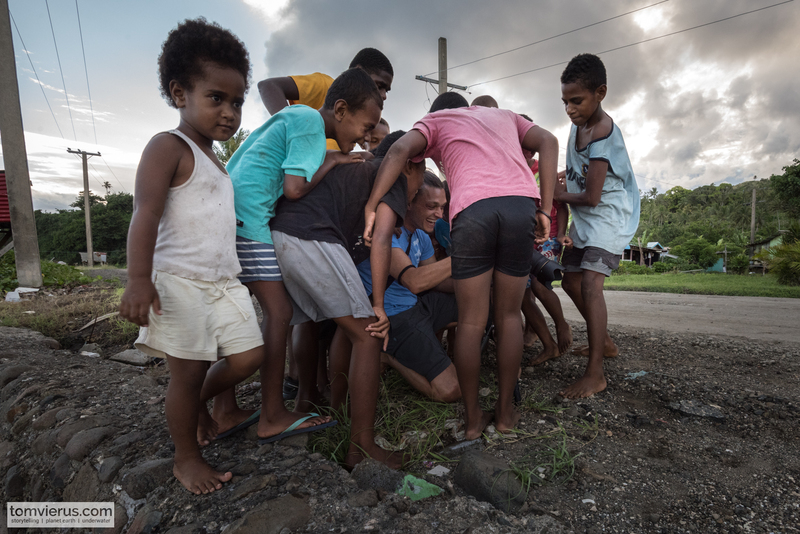 After some computer hours and several emails, I received approval from Fiji Film and soon thereafter a drone permit from the relevant institution. Officially there were no more obstacles and we had the green light to go ahead. 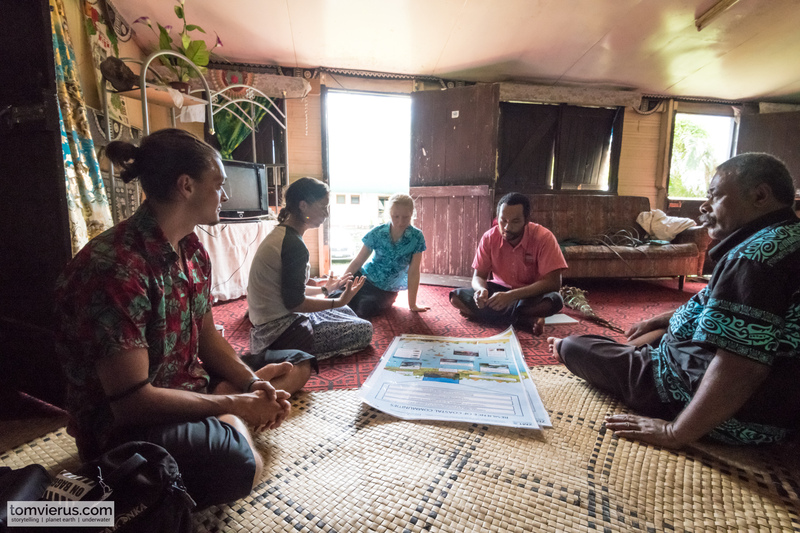 One of the first meetings that Amanda, Akuila and myself embarked on was with the I-Taukei ministry in Suva. 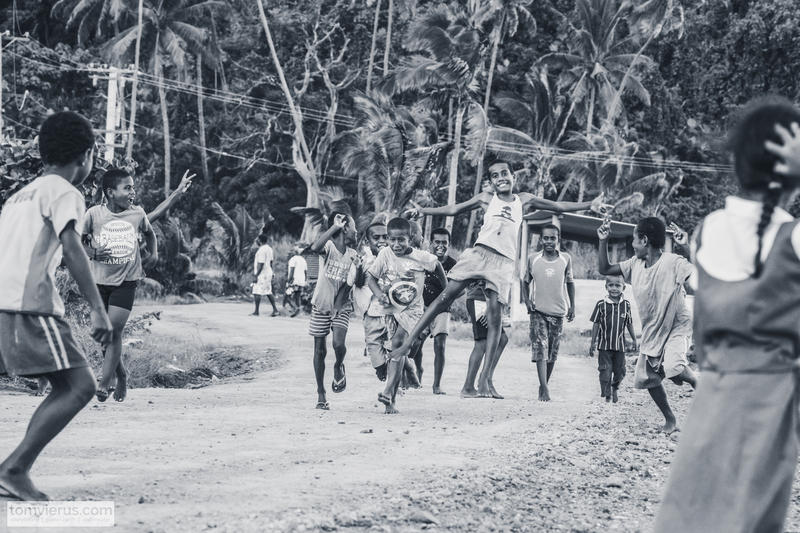 This ministry safeguards, protects, and enhances community wellbeing and the traditional Fijian heritage. 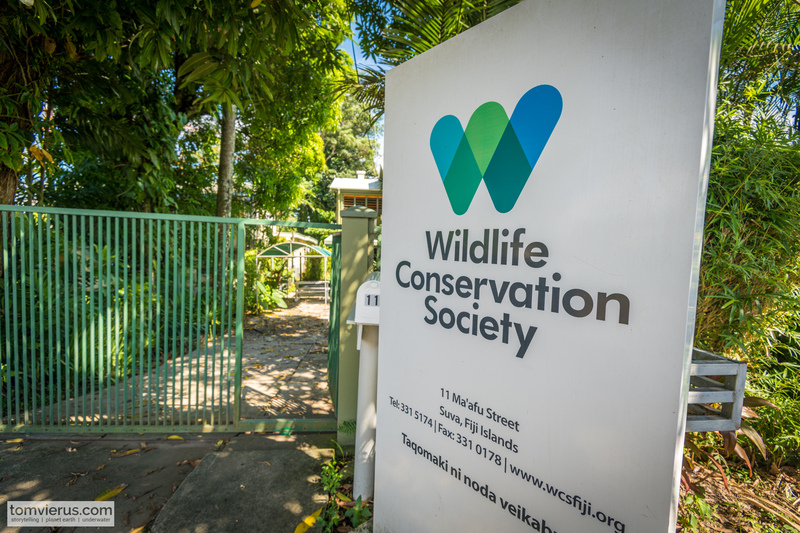 Together with Dr. Sangeeta Manguhbai, the director of the Wildlife Conservation Society in Fiji (and also the Fijian counterpart of the REPICORE project) the team presented the main purpose of the trip. Not only would the team visit each community they had worked in, but additionally we had designed and printed visually appealing posters that would stay in the respective communities. The science director of the ministry applauded the team’s efforts and stressed again the importance of sharing knowledge with the communities. 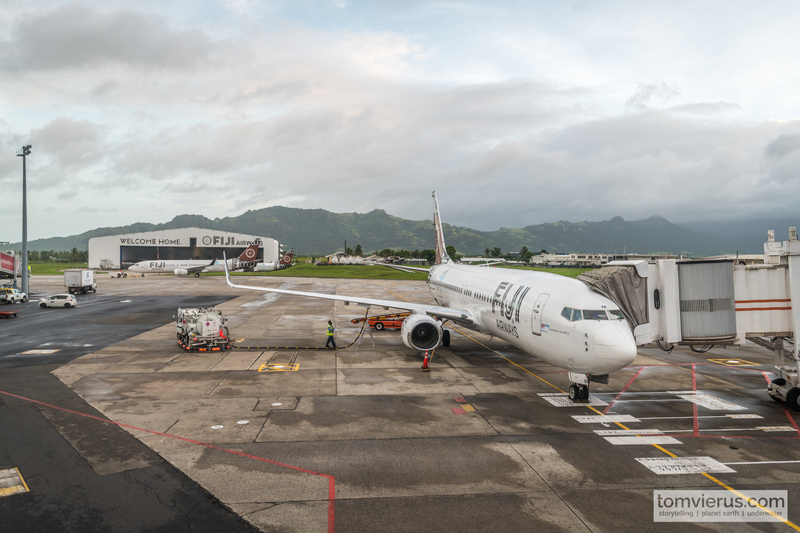 I personally had to deal with another problem: due to the recently renewed Immigration policy of Fiji, I had to leave the country in order to obtain a new 14 days valid Business visa. 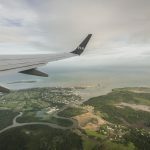 I thus flew to Apia in Samoa where I spent four nights. The islands had just been hit by the Category 4 Cyclone Gita and suffered under severe flooding in its capital. Luckily by the time I arrived, the water had receded in most parts but traces of the strong storm were still visible around the country. I encountered large areas with broken trees stripped of their leaves. We had observed the path of Gita a few days before as Fiji itself was at risk, but was luckily spared eventually (almost to the day 2 years after Category 5 cyclone Winston, the biggest storm to ever make landfall in the southern hemisphere). One of the German monuments in the middle of the Pacific. This one here can be found in Apia, Samoa. 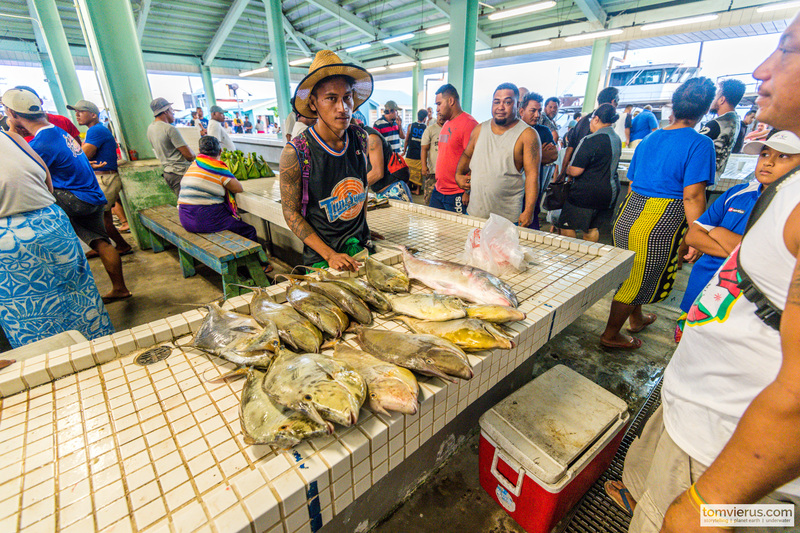 Early on Sunday morning, I visited the fish market in Apia to browse through their catch. Unfortunately, Tonga found itself right in the path of Gita and large parts of the capital’s infrastructure were destroyed. 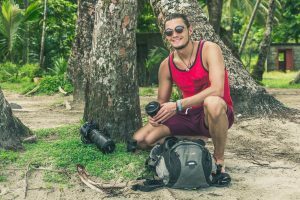 I made the best out of the forced break and explored Samoa’s main Island Upolu with Tai from Tai’s Native Experience. Tai is a great guy and knows a lot about Samoan history. 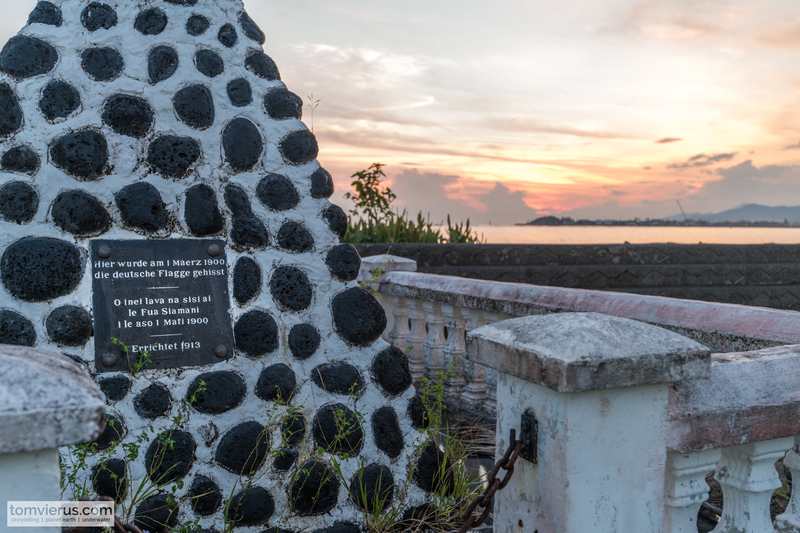 Interestingly, the island of Samoa once was a German colony and to my surprise, I even found some German monuments in its rather unspectacular capital Apia. While driving along the coastline it struck me straight away: climate change is a daily part of the peoples’ lives here and it’s always and everywhere present. 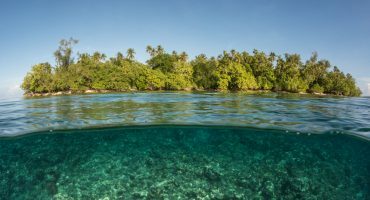 While back in Europe results might not be as visible to us, Pacific Islanders are constantly dealing with increasing storm intensities and irregular weather patterns, warming waters with all its negative consequences such as coral death, and the often discussed rising sea surface levels. 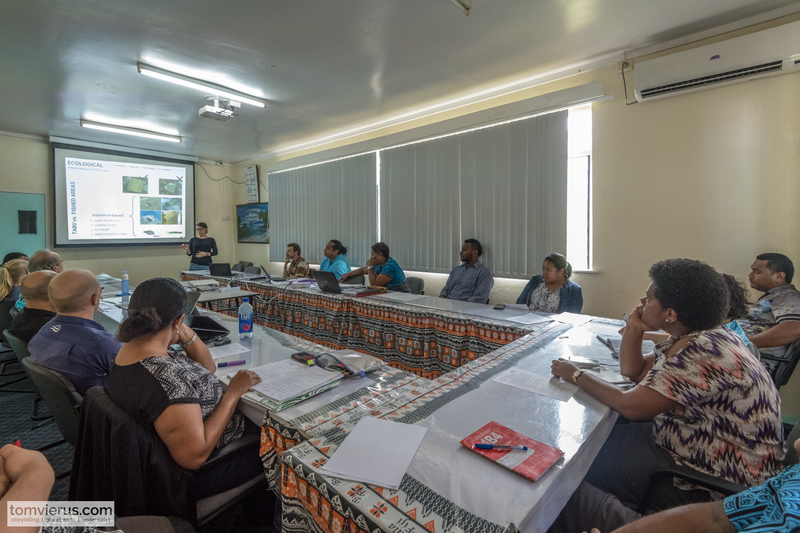 While I was in Samoa, Amanda and Sebastian were in Papua New Guinea attending a workshop with various staff of the National Fisheries Authority. 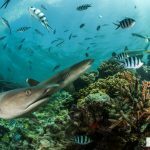 Amanda had conducted an ecological study north of Manus for which she investigated the input of beach toilets on adjacent coral reefs. 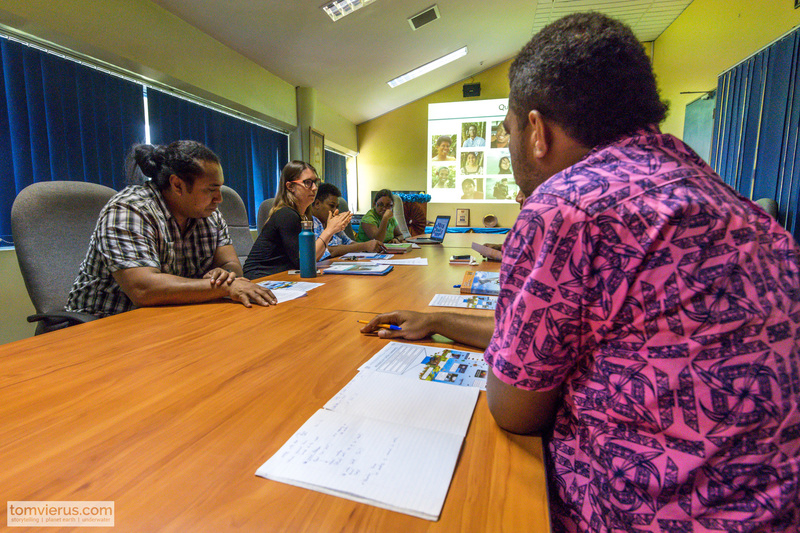 We all met up in Fiji a few days later, where the REPICORE team hosted another workshop, this time at the Ministry of Fisheries in Lami. 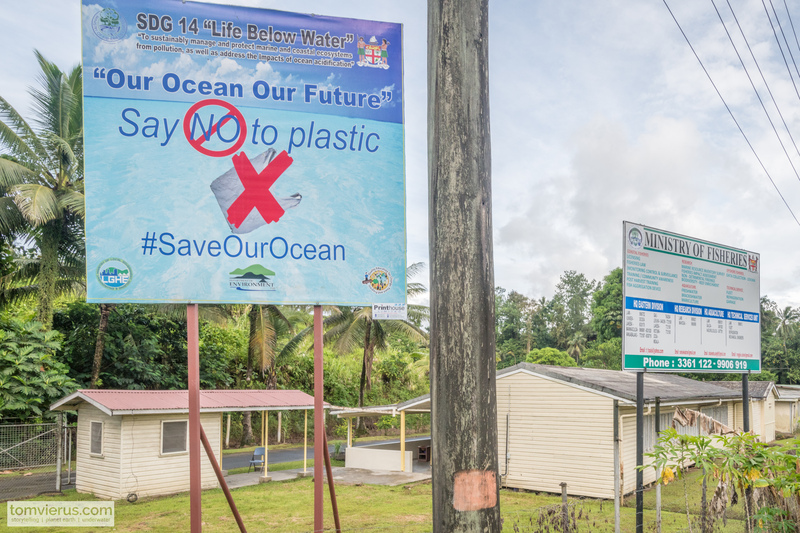 Representatives of WCS, the Ministry of Environment and other resident scientists attended resulting in more than 20 people participating in the discussion. 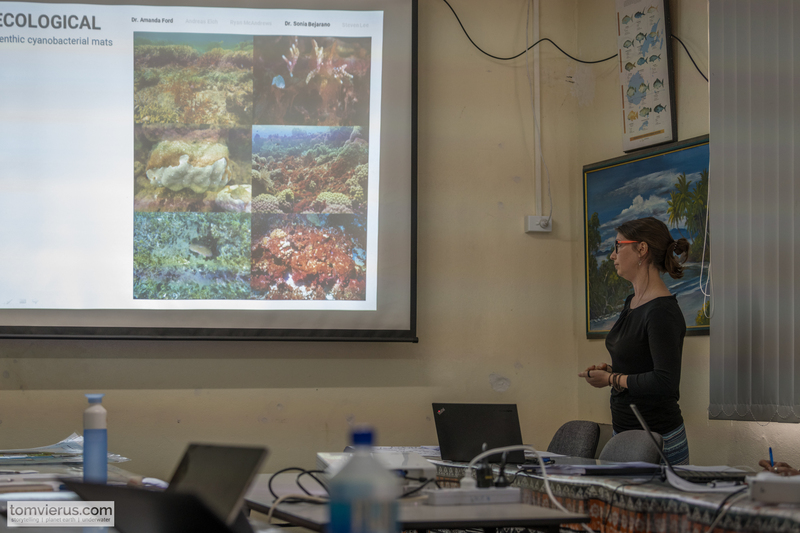 Amanda stressed her findings on benthic cyanobacterial mats and their potential threat through a ciguatera-like sickness and reported from her findings on sea cucumbers and the need of a revised coral reef survey methodology with more than the conventional metrics. Especially the cyanobacterial mats were highly interesting and although there isn’t much data available, this field of research will surely expand in the near-future. Janne and Akuila presented their work on marine governance and gender equality as well as climate change vulnerability of coastal communities. Here, especially the role of woman in the patriarchal communities and the traditional governance system was discussed and, though a highly sensitive topic, participant surely took home ideas and inspiration from the open discourse. Say No to plastic! Great message by the Fisheries Department in Lami. 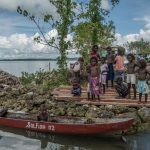 Over the following days, we visited several communities along the Coral Coast. We underwent the obligatory sevusevus (the traditional ceremonies as you enter villages) and presented the results to village elders and spokespeople. The participation of the people was highly encouraging and I think I can speak for the team that it highlighted the need for engagement with those people who are affected the most. 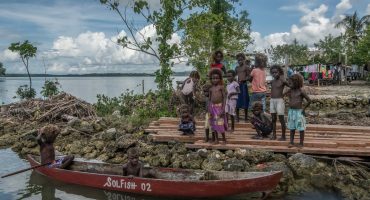 No doubt, climate change cannot be stopped by the communities but they do have the chance to increase their resilience to its effects. This, of course, is highly context-specific and may be achieved by diversifying their livelihoods (farming, fishing, jewelry production etc. ), planting mangroves to decrease sedimentation, refraining from certain fishing techniques etc. 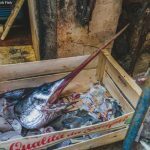 One particular technique which is widely practiced in the Pacific region is nighttime spearfishing. 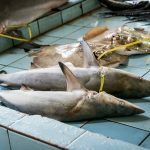 While it might generate quick and relatively easy money, the long-term consequences are overfishing and depletion of certain species. Most fish sleep at night and are an easy target for scuba or free divers with a torch and a speargun. Commercially valuable fish are targeted first and immense amounts can be taken out in a course of one night. Of course, sometimes fishermen might not have a choice, but by using destructive fishing methods these people might deprive their children of enough fish in the future. 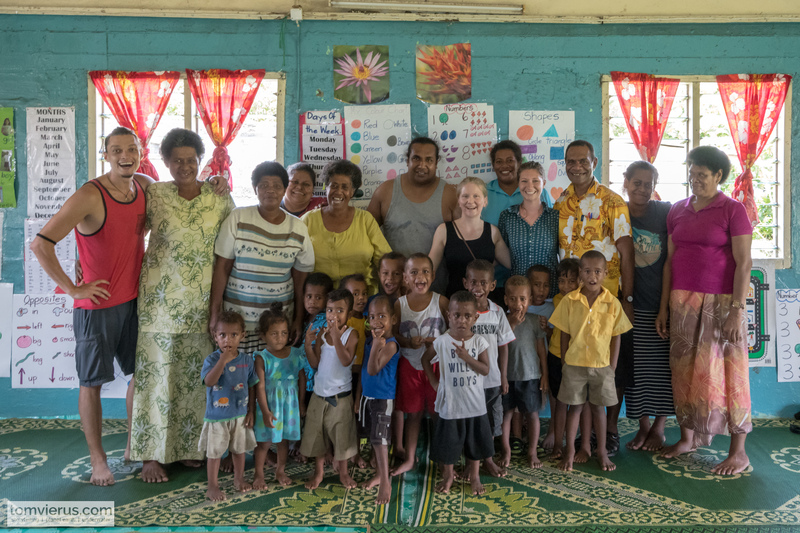 After a successful week Amanda, Janne, Akuila and myself flew on to Ovalau, a little island situated to the east of Viti Levu. We would visit Natokalau which was the only community where all three had worked in (at different times). Accordingly, the visit was quite emotional with many reunions and hugs for the team. 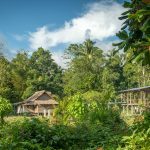 Due to our tight schedule, we were only able to stay one night in the village but made the most out of the short time. 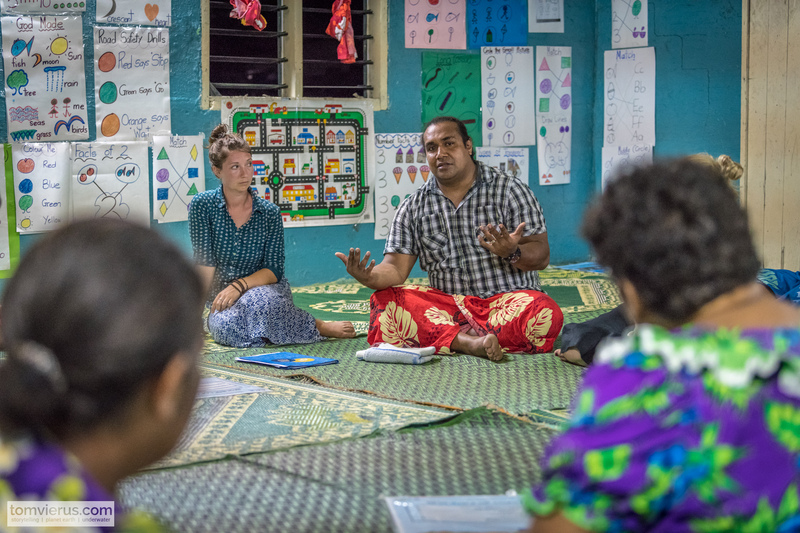 Before presenting our work in the community itself, we visited the local department of environment and spoke to the Torani koro (headman) about the findings. Once again the team presented him the poster and as we went through the discussion it became clearer how much the REPICORE findings interlink with their own projects and studies. 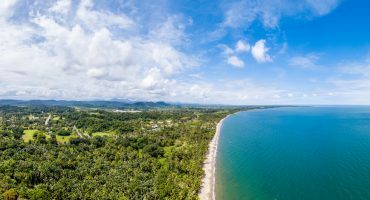 He greatly appreciated the feedback and said the materials and scientific papers would greatly strengthen their position in pushing for better policies towards healthier coastal areas and less vulnerable communities. 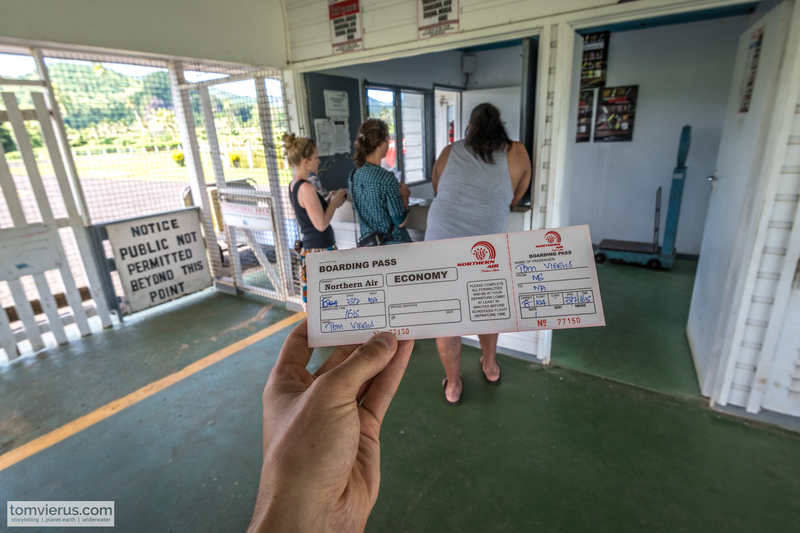 After the meeting, we spent some time in Levuka, Fiji’s old capital and a little town which strongly reminds me of old cowboy movies. I decided to shoot a few aerial scenes and put up the Mavic Pro. The weather was perfect – no rain, no wind, and sunshine. I flew a few meters above the ground and towards the open ocean when suddenly…… the drone simply dropped into the water. At first, I didn’t even notice what happened, if it wouldn’t have been for Akuila, who said the drone fell in the water! I was still looking at the ocean on the screen of my phone (which functions as the eye for the pilot) when I got an alarm signal that the connection had failed. Well, I would have expected it would show me that BEFORE it fell into the water!! I looked up and it was hard to realize what just happened. THE DRONE WAS GONE! And I had no part in it – no dangerous flying, no stunts, nothing. It was a technical failure and I would have to pay for that – there was still much of the trip ahead of us.. I was pretty sad and mad at the same time but couldn’t really do much and instead just focused on finding a solution. How could I get or borrow another one asap? Amanda and I would be going to Beqa after the weekend and after that, I would be joining Akuila and Janne in the Solomon Islands. There had to be a way.. I didn’t have too much time to worry about that now as we were expected in the village. The elders and a range of other people had aggregated in the school waiting for Akuila, Janne, and Amanda to share their findings with them. As usual, Amanda started out with the ecological part with Akuila translating some of it. 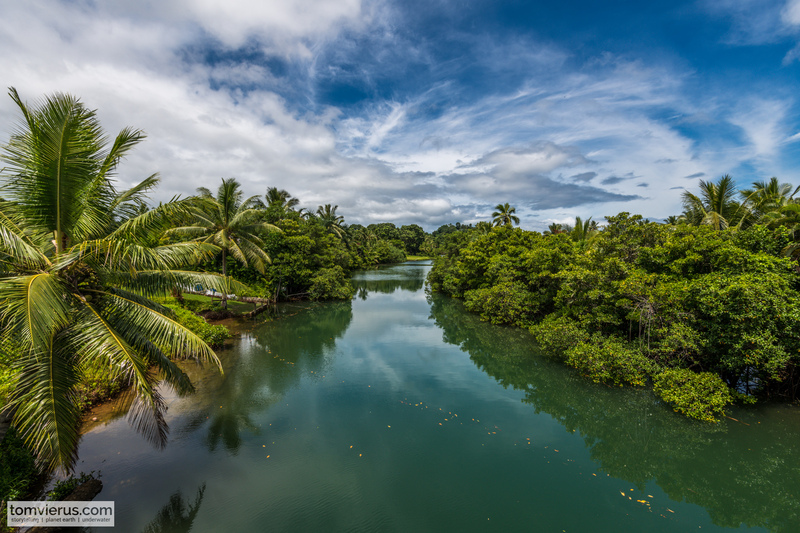 While Fijians almost always speak and understand English, some of the terms used in science (and some that simply cannot be substituted by easier terms) are far from common language and a Fijian explanation comes in handy. It turned out to be a great meeting with a number of questions in the end and (of course) a grog session right after. 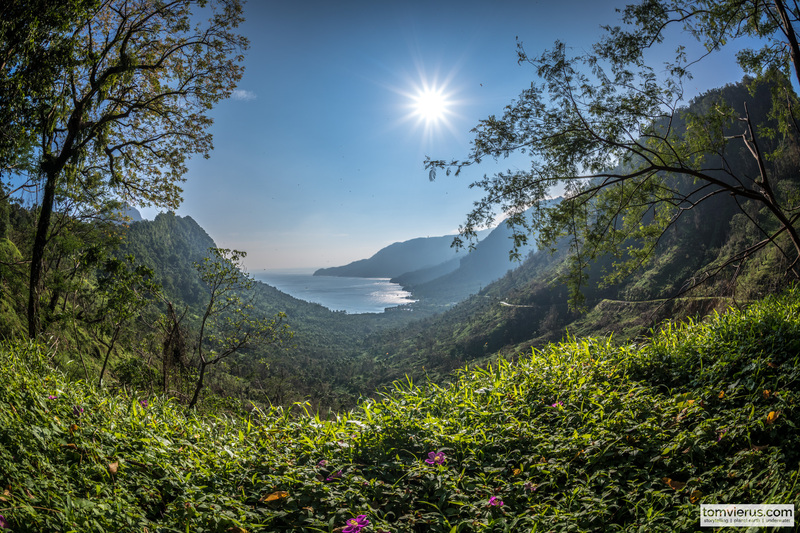 Kava, derived from a plant of the pepper plant family, is deeply rooted in the Fijian culture. The plant’s roots are dried and then ground before being dissolved in bowls of water. The resulting brown water is then drunk out of coconut shells with accompanying rituals. 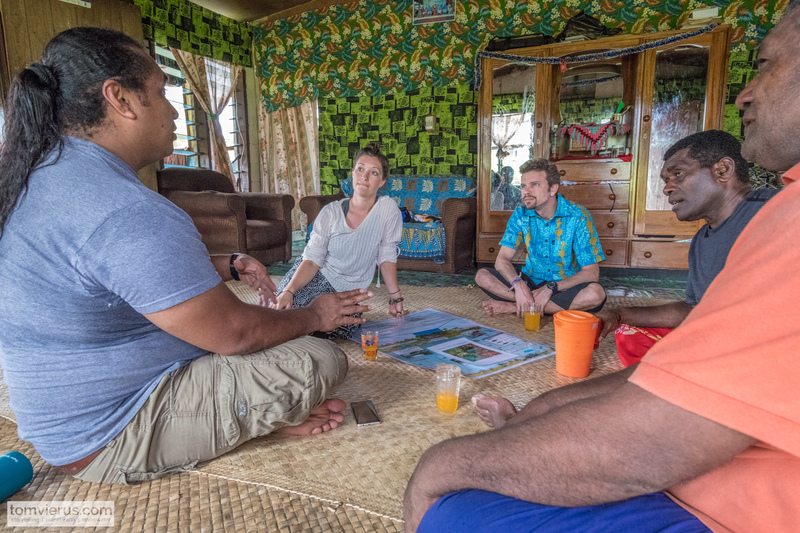 While the kava itself tastes a little muddy I do like it (from time to time) and drinking a few bowls with the Fijians makes them extremely happy – so why not! After some socializing, we went to bed happy and moved on to the airport the following morning. People were sad to say goodbye, but surely it wasn’t our last time here. We took the tiny plane back to Suva and were looking forward to some time off. While Akuila met up with his relatives, Janne, Amanda and I stayed in a place at the Coral Coast. 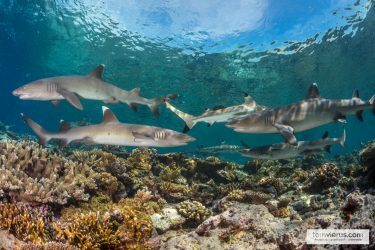 I was looking forward to more dives with Beqa Adventure divers and some shark time. Janne was about to fly to the Solomon Islands the following Sunday to meet up with Akuila and I would join them after the visit with Amanda on Beqa and some more meetings around Suva. The next morning we visited the school and sung songs with the kids, moms and the teacher there. Great fun and super friendly people! 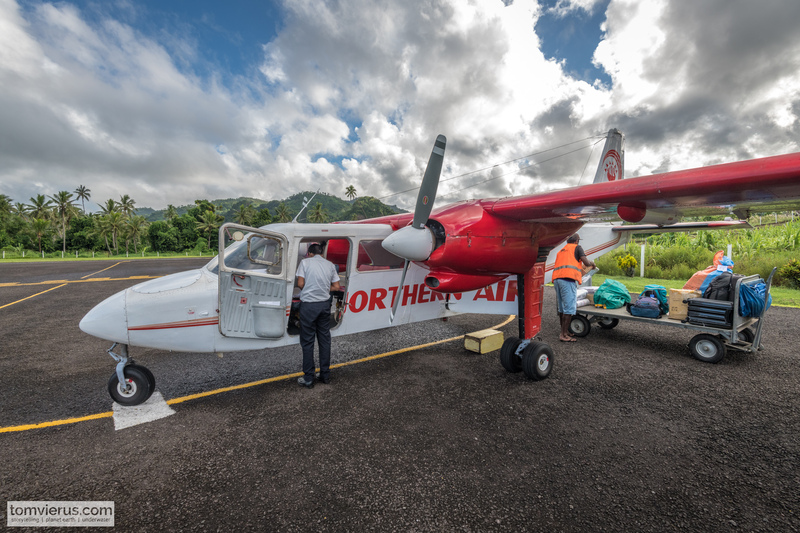 This eight-seater brought us from Suva to Ovalau and back again – a great adventure!